 Twenty years after his goldfish dies and he stops loving his mother or anybody else, Douglas Tate is working as an Edinburgh undertaker. It's a good job for Douglas, because he's always been most comfortable with people--especially women--who don't cling to him or talk back or move very much at all. When his mother and his abusive stepfather leave for Australia and Douglas is left for the first time in his own bed-sit, it looks as if he'll finally be free to make his perfect match with Marjorie Milton, whose asthma and shyness conspire to make her as passive as Douglas might wish. But a chance encounter with a prostitute awakens desires that are hideously, comically at odds with Douglas's reserved comportment--and as he keeps meeting Marjorie at the Fish Are Fun evenings (where the abortive lovers talk earnestly of keeping aquariums stocked with companions even more quiet than they are), he privately agonizes whether there isn't some way he can keep Marjorie all to himself, as still and silent as one of his clients as Reevon's Funeral Parlor. . . . No real surprises in this pathological debut (a lot more ruminative and creepy than Do-Not's recent offerings). 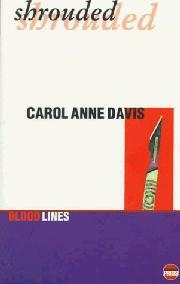 But Davis creates a marvelously mundane context for her frightened hero's murderous fantasies. Following the progress of his necrophiliac romance is like watching the Titanic and the iceberg glide inexorably toward each other.